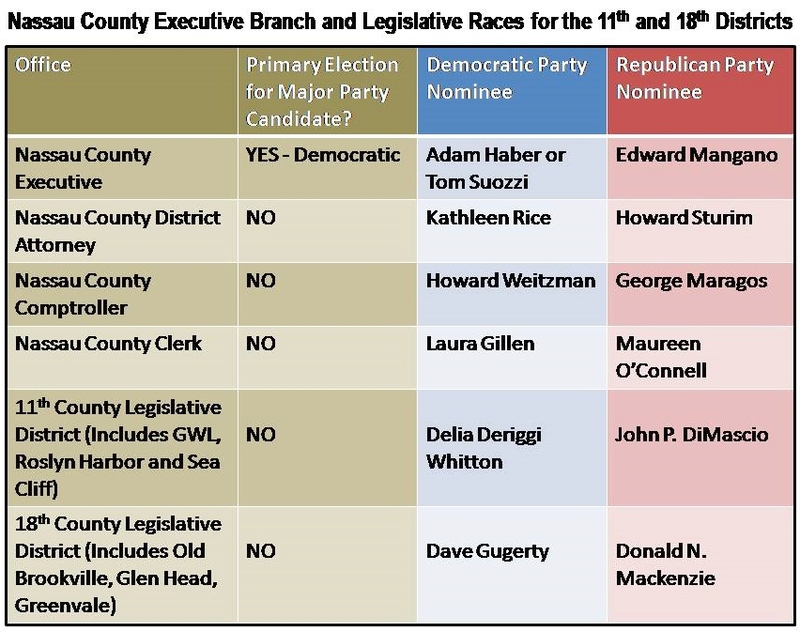 Tuesday, September 10 is Primary Election Day, and voters in this area who are registered in one of the two major political parties will have only one opportunity to have their voices heard by casting a vote in the contest between Adam Haber and Tom Suozzi for the Democratic Party nomination for County Executive. The winner will face Republican incumbent Ed Mangano in the general election on November 5th. The tables above show which elections are being held this November and the major party candidates. And while no federal or state offices are on the ballot, many county and town offices are. (Please note that many judgeships are up for a vote as well. They are not listed above but will appear in Northwordnews.com's General Election Guide in mid-October). If you are registered in the Independence or Green Party, you will have a few more opportunities to have a say this coming Tuesday. Voting will take place at your voting place for regular general elections. 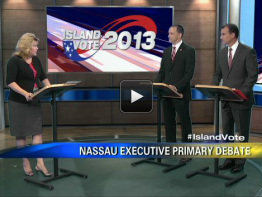 Click here to see the primary ballot for Tuesday, September 10th. After more than two years of studying, debating, drawing and redrawing, a new county legislative district map was adopted earlier this year, passed by the legislature along a party line vote with 10 Republicans supporting and nine Democrats opposing the re-districting plan. The districts in our area have been greatly affected. Democratic opposition to the new map was in part based on how the new district lines pitted two sets of incumbent Democrats against each other, and gave the GOP a good opportunity pick up the 18th District seat. 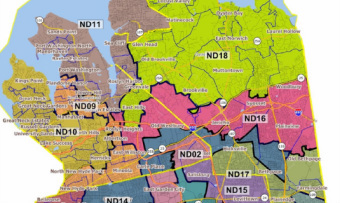 Currently the North Shore School District area is divided between two districts - the 11th which includes Glenwood Landing, Roslyn Harbor, Roslyn and Port Washington, and the 18th which includes Sea Cliff, Glen Head, Glen Cove, and the Brookvilles. 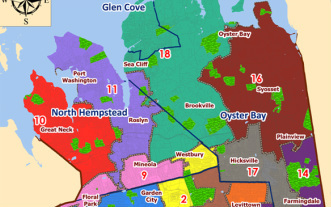 The new 11th District stretches along the shores of Hempstead Harbor from Port Washington to Glen Cove. As a result, Sea Cliff and Glen Cove will now be in the 11th. The 18th was pushed eastward and includes Glen Head, the Brookvilles, Locust Valley, Bayville and Oyster Bay. 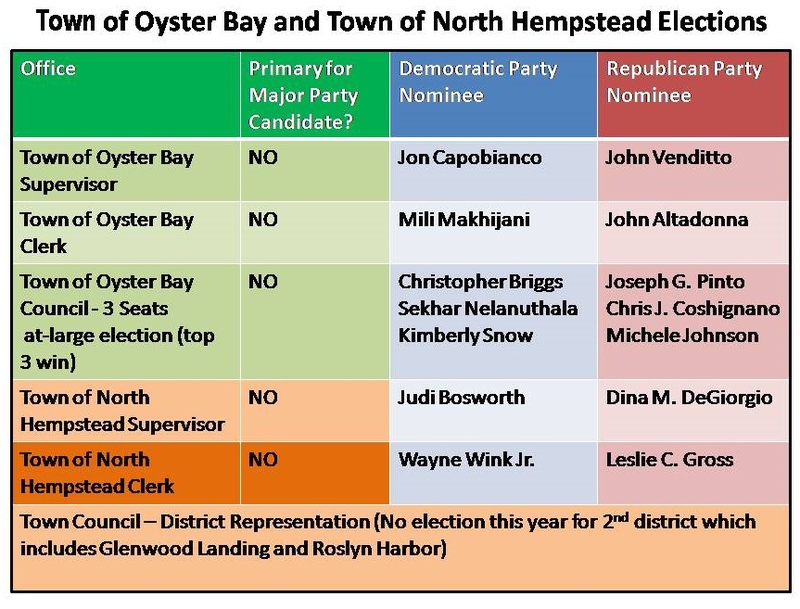 These changes pushed two Democratic incumbents, Wayne Wink of East Hills and Delia Deriggi-Whitton of Glen Cove into the same district. Mr. Wink chose not to seek re-election and initially announced that he would be running for County Comptroller. After Howard Weitzman, who had served as Comptroller from 2002-2010, announced that he would be seeking to get his old job back, Mr. Wink bowed out of the race and is now running for the position of North Hempstead Town Clerk. Ms. Deriggi-Whitton, who formerly represented the 18th District, is now running to represent the 11th and is not facing a primary opponent. She will run against Republican John DiMascio of Glen Cove in the general election this November. In the 18th District, Democrat Dave Gugerty of Bayville will be running against Republican Donald MacKenzie of Oyster Bay. Delia-Deriggi Whitton (D - Glen Cove) currently represents the 18th District and Wayne Wink Jr. (D- East Hills) the 11th. Note the changes to the 11th and 18th Districts. Wayne Wink is not seeking re-election and Delia Deriggi-Whitton is the Democratic nominee for his 11th district seat. She will be facing off against Republican John DiMascio in the general election. In the 18th, it will be Democrat Dave Gugerty versus Republican Donald MacKenzie on November 5th. POLITICAL BACKGROUND - Roslyn School Board Trustee, 2009-Present. Mr. Haber touts his success in more than 25 years in business and finance, and his accomplishments on the Roslyn School Board, as qualifying him for the office of County Executive. He says that his business experience has allowed him to help the Roslyn Schools run in a more efficient and fiscally responsible way. Since 2009 when he took office, he writes on his website, "We've refinanced the district's debt, set up cooperative busing with other districts, explored more affordable employee healthcare plans, and collaborated with NEFCU to create a community credit card that provides a percentage of purchases to be donated back to our schools." In addition, Mr. Haber says that he has sought to give residents a greater voice by launching the Nassau Suggestion Box, an online forum where one can offer ideas for budgetary and fiscal reform. "This website has amplified the voices and concerns of taxpayers," he writes, "I’m thrilled I’ve generated such meaningful dialogue on ways to improve Nassau County government." County to make smarter investments in job creation, the environment, education, technology, and innovation," he writes. enrollment as a factor in employment." POLITICAL BACKGROUND - Nassau County Executive, 2002-2010; Mayor of Glen Cove, 1993-2001. Mr. Suozzi points to his fiscal stewardship of the County during his tenure as County Executive from 2002-2010 in making his case as to why he should be returned to that position. Before entering office, his website states, Nassau County had been labeled "the worst run county in America." Suozzi boasts eight balanced budgets during his two terms and "eight verified surpluses," as well as 13 bond rating upgrades. In addition, according to his website, government spending was kept below the rate of inflation every year, and the county saw a reduction of more than 1,000 county jobs (11% of the government workforce) through attrition, without any lay-offs and signed labor contracts that "were long lasting and affordable." Under his leadership, he says, Nassau County government modernized and became more efficient through "smart government initiatives" such as creating a central IT department and ridding the county of obsolete equipment. On tax issues, Mr. Suozzi, says that during his two terms in office, the county portion of total household tax obligation shrunk from 22.7% to 16.4%, and that he was "the original proponent of New York State’s property tax cap that Governor Cuomo recently signed into law." Like his opponent Mr. Haber, Mr. Suozzi is very critical of the Mangano administration, saying that "Nassau families cannot afford another four years of reckless borrowing, bond downgrades, and a broken assessment system that is costing the County millions." Mr. Suozzi portrays himself as a forward looking candidate with a long-term vision for Nassau’s future that includes "downtown revitalization, smart growth development, and green initiatives would transform Nassau into the ideal suburb for us and for the next generation. " He has expressed concerns about the drop in population on Long Island among those who are in the 25-34 age group, and as a result has proposed a "New Suburbia Trailblazers” program to encourage development of walkable, downtown areas near train stations that would be attractive to young college graduates. Adam Haber has portrayed himself as a successful businessman, Democratic Party outsider, and champion of transparency who will not succumb to a culture of cronyism and patronage. His ad campaign targets both County Executive Mangano and Mr. Suozzi, painting both as immersed in crony party politics. Haber's late June advertisement featuring a group of men sitting at a dinner table and drinking red wine brought negative attention to his campaign as many complained that it played into stereotypes of Italian-Americans. The ad was pulled, but the message of the Haber campaign that he is the only candidate who will be able to resist cronyism and who will hire based on merit, is a mainstay of his advertising strategy. Tom Suozzi's approach has been to play the role of presumptive Democratic nominee, looking past Mr. Haber and focusing his criticisms on County Executive Ed Mangano. In addition he highlights his successes during his eight year tenure as County Executive.